SiebenCarey has three personal injury law offices located throughout Minnesota, including an office in Lakeville, Minnesota. The Lakeville office is located in the heart of historic downtown Lakeville at 20876 Holyoke Avenue, across the street from the Dairy Delight. Some nearby communities include: Burnsville, Eagan, Apple Valley, Rosemount, Farmington, Prior Lake, New Prague and Cannon Falls. Because of the convenient south metro location, many of the attorneys at SiebenCarey meet with clients at our Lakeville office. 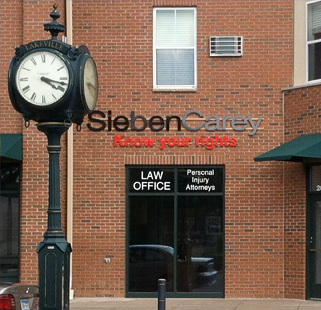 The SiebenCarey Lakeville office is located at 20876 Holyoke Avenue in downtown Lakeville. Take the CR 50 exit; at the bottom of the ramp, turn left on Kenwood Trail/CR 50. Follow CR 50* about 4 miles to the 4-way stop at Holyoke Avenue; turn right on Holyoke Avenue and follow to 209th Street. Follow CR 50 to the stop lights at Dodd Blvd. Turn right on Dodd Blvd to the 4 way stop at 210th Street. Turn left onto 210th Street to the stop sign at Holyoke. Turn left on Holyoke and go 1 block to 209th Street. Take the CR 70 exit; follow CR 70 east to Holyoke Avenue (about 3 miles); turn left on Holyoke Avenue and follow to 209th Street. Take the CR 50 exit in Hampton and go west; follow CR 50 through Farmington and into Lakeville to Holyoke Avenue. Turn right on Holyoke and go 2 blocks to 209th Street.